To what the Heat would do to the sound coming from DT vs the sound without FX coming out from DT directly to speakers. That was the whole thing here remember? Doesn’t matter as the sample will be converted to mono anyway. Though not sure if you’re serious or joking. I’m not too clear on what we’re talking about to be honest; I thought I was. The DT can only playback mono samples, but the sound coming out of the DT’s 2 outputs do not have to be mono is the only point I wanted to make I guess. Getting back to this. As this is the root of the discussion here. The only thing that is mono is the sound source (samples). The same way the synth voices in A4 and Rytm are each mono. I doubt it’s output scheme has anything to do with buying an Analog Heat, or being suggested to buy one. But it’s not “natural” stereo, i.e. the sounds are not of a natural stereo field, they’re “pan-potted” to create the image of a stereo field. It might not matter, but it helps to have an idea of how it works. Does it not help to have a bit more knowledge of the actual physics behind the process, as EasternNoise has provided? Idk I guess I just assumed this was common sense. If you create a stereo field artificially, it’s an artificial stereo field. But you’ll never convince me that a stereo field is anything more than two mono signals. And don’t forget that you can use the same sound on two tracks, adjust them to your liking and pan them left and right. Though the original sample is mono, you can make your own stereo environment to great detail. Same sound panned to the extremes has the same phase. It’s very different. Actual stereo field has delays. Stereophonic sound or, more commonly, stereo, is a method of sound reproduction that creates an illusion of multi-directional audible perspective. This is usually achieved by using two or more independent audio channels through a configuration of two or more loudspeakers (or stereo headphones) in such a way as to create the impression of sound heard from various directions, as in natural hearing. Thus the term “stereophonic” applies to so-called “quadraphonic” and “surround-sound” systems as well as the more common two-channel, two-speaker systems. It is often contrasted with monophonic, or “mono” sound, where audio is heard as coming from one position, often ahead in the sound field (analogous to a visual field). In the 2000s, stereo sound is common in entertainment systems such as broadcast radio and TV, recorded music and the cinema. Panned mono sound is not multi directional. I guess I have confused people a little haha. If you pan a mono sound it will stay and sound exactly where you panned it. 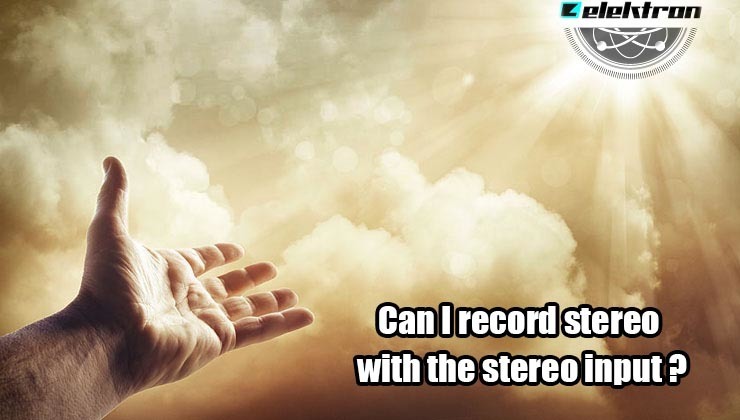 It’s not true stereo. It’s still mono. Stereo sound will be audible in both ears even when you balance it’s position (stereo sound does not have pan because it’s multi directional as described in the definition in post above). The only way digitakt sample will sound in stereo is when you apply FX. Because it isn’t. When you pan a mono signal it only comes from that position. That changes when you apply stereo FX, it can bounce on the entire spectrum with a delay or spread and get “wide” with nice reverb. By itself it only sounds where you placed it. Get this plugin if you can and play with mono vs stereo samples. Great visual representation. That doesn’t make any sense to me. This conversation is way over my head I think. How about a room set up with 4 to 5 signals, live - each amplifier is recorded individually, with an additional microphone (or two) capturing the overall room sound. So, you have six or seven signals, and yeah, they can be mixed down to two channels. By that point you’ve already compromised the spatial qualities (mingling frequencies etc.) of the acoustic phenomena that occurred in the original recording. It’s further compromised, or lessened, by summing those two channels to one. Yes, you can pan subsequent signals in the mix, but you’re not getting an accurate spatial representation of the original sample. I never said anything contrary to this. As I understand it, a stereo field provides the ability for multi directional sound regardless of whether or not it is a natural or artificial stereo field. and what about automating pan of a mono DT sample? with LFOs, p-locks, trigless trigs, etc. It’s not staying in one position. It most certainly is not mono, even with the FX off. And again - what does this have to do with pairing it with a Heat? Church with single cluster floor coverageMono or monophonic describes a system where all the audio signals are mixed together and routed through a single audio channel. Mono systems can have multiple loudspeakers, and even multiple widely separated loudspeakers. The key is that the signal contains no level and arrival time/phase information that would replicate or simulate directional cues. Common types of mono systems include single channel centre clusters, mono split cluster systems, and distributed loudspeaker systems with and without architectural delays. Mono systems can still be full-bandwidth and full-fidelity and are able to reinforce both voice and music effectively. The big advantage to mono is that everyone hears the very same signal, and, in properly designed systems, all listeners would hear the system at essentially the same sound level. This makes well-designed mono systems very well suited for speech reinforcement as they can provide excellent speech intelligibility. True stereophonic sound systems have two independent audio signal channels, and the signals that are reproduced have a specific level and phase relationship to each other so that when played back through a suitable reproduction system, there will be an apparent image of the original sound source. Stereo would be a requirement if there is a need to replicate the aural perspective and localization of instruments on a stage or platform, a very common requirement in performing arts centres. This also means that a mono signal that is panned somewhere between the two channels does not have the requisite phase information to be a true stereophonic signal, although there can be a level difference between the two channels that simulates a position difference, this is a simulation only. That’s a discussion that could warrant a couple of web pages all by itself. An additional requirement of the stereo playback system is that the entire listening area must have equal coverage of both the left and right channels, at essentially equal levels. This is why your home stereo system has a “sweet spot” between the two loudspeakers, where the level differences and arrival time differences are small enough that the stereo image and localization are both maintained. This sweet spot is limited to a fairly small area between the two loudspeakers and when a listener is outside that area, the image collapses and only one or the other channel is heard. Living with this sweet spot in your living room may be OK, since you can put your couch there, but in a larger venue, like a church sanctuary or theatre auditorium, that sweet spot might only include 1/3 the audience, leaving 2/3 of the audience wondering why they only hear half the program. In addition a stereo playback system must have the correct absolute phase response input to output for both channels. This means that a signal with a positive pressure waveform at the input to the system must have the same positive pressure waveform at the output of the system. So a drum, for instance, when struck produces a positive pressure waveform at the microphone and should produce a positive pressure waveform in the listening room. If you don’t believe that this makes a tremendous difference, try reversing the polarity of both your hifi loudspeakers some day and listening to a source that has a strong centre sound image like a solo voice. When the absolute polarity is flipped the wrong way, you won’t find a stable centre channel image, it will wander around away from the centre, localizing out at both the loudspeakers. I don’t have any more time to invest in this conversation. I think I’ve been very clear with the points I wanted to make. I’m not sure about what we’re talking about anymore. This also means that a mono signal that is panned somewhere between the two channels does not have the requisite phase information to be a true stereophonic signal, although there can be a level difference between the two channels that simulates a position difference, this is a simulation only. Right, that is completely understood. However, you implied that the DT is mono. Where as it is not. As it uses pan for samples, even with FX off, it is simulated stereo, sure. But not mono. No one has suggested it is “true stereo” which is understood as stereo in — > stereo out.